Congratulations to Meghan Halloran ’17 on being named Second Team All-NESCAC for women’s hockey as announced last Wednesday by the NESCAC, following the votes of conference coaches. 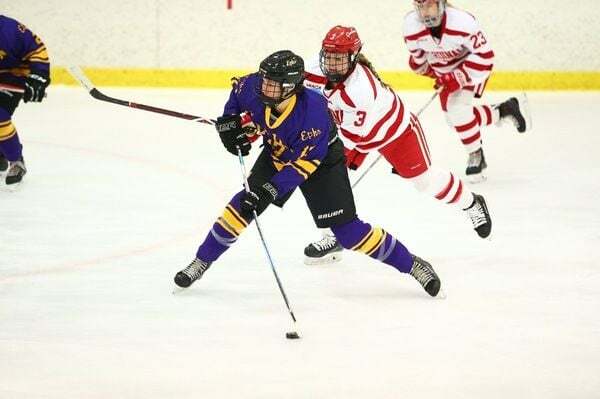 In her first collegiate season at Williams College, Meghan played in all 25 games this winter, she led the Ephs in assists and points, and was second in goals scored. She tallied 10 goals this season and recorded 16 assists for a total of 26 points. The Williams College women’s hockey team was eliminated in the NESCAC quarterfinals by Amherst College. Overall, the Ephs posted a 10-7-7 and 4-6-6 NESCAC record this season. With one collegiate season under her belt, Meghan has already started her second season with the Williams women’s lacrosse team this spring. In her first game, Halloran notched an assist in a 9-10 OT loss to Wesleyan. The Ephs will take the field again this evening as they face-off against RPI at 7:00pm. At Deerfield, Meghan was a 3-sport varsity athlete in soccer, hockey, and lacrosse. Captaining both the hockey and lacrosse teams in her senior year. Congratulations, Meghan! Go Big Green!